How to make your precious Afro waves and coils even more defined and beautiful? Designed specifically for African-American hair, the wave brush can be a great complement to your everyday hair routine. Made with natural boar bristles, it helps to distribute natural oils and styling products along the length of each strand, making your hair smoother and shinier. And who doesn’t want that? Also, wave brushes can be a great help in taking care of your beard. 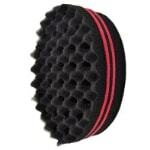 And if you prefer to wear 360 waves, also known as “360s” or “spinnas,” a wave brush is a must-have for you! Here are my favorite wave brushes that I’ve got to work with so far. The reviews are based on both my own experience as a hairstylist and opinions of my clients: many of them use a wave brush on a regular basis. When I got this brush, I was a bit surprised because the handle was shorter than I’d expected. With time, I got to see the true value of this brush, so now the size isn’t the key factor for me. The bristles cover enough hair with each stroke, and the brush itself won’t take much space in your travel bag because it’s lightweight and compact. Plus, there are some grooves on the back of the handle. They ensure that the brush doesn’t slip around easily when it’s on a smooth surface. 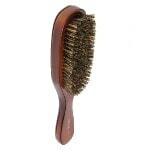 This Annie wave brush features a wooden handle and boar bristles. The bristles may feel too soft. Personally, I use it for smoothing the hair or distributing styling products. It’s rather hard to comb hair with this brush properly. On the bright side, you can use this brush for adding volume. It kind of fluffs hair rather than flattens it, so if you want your mane to have more volume, go for it. All in all, it’s a great deal for the price. grooves on the back of the handle don’t allow the brush to slip around. too soft for combing hair properly. The black design of this 360 gold wave brush definitely stands out with this gold crown thing on the handle. The brush itself is big enough to fit in the palm of your hand, and the rounded shape is rather convenient. The manufacturer promises that it will help you start your 360 wave pattern, quickly generating wave formation. It works pretty well indeed. 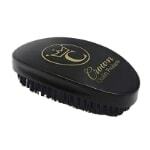 This Crown wave brush works great for thicker, stubborn hair that is difficult to tame. Basically, you can use it either for straightening or for widening wave patterns. The reinforced flex bristles help to stretch and widen wave pattern, and you’ll probably see an improvement in your waves in a few days. Just keep in mind that it’s a hard bristle brush that will soften with use. For some people, it may feel too hard at first. I would say it’s a medium to hard wave brush. Since the brush is made of real wood, the base can crack in case of careless use. I’ve heard a lot of complaints about the poor quality of that particular brush. The one thing I can say for sure – do not place this brush under cold water. Also, the paint may start to chip, but I guess, that’s not so critical. comes with a nice bag plus wave grooming instructions. Well, this brush only partly consists of natural boar bristles. Between 1 and 5 of the bristles in each bunch are natural, and the remaining ones are made of synthetic similar to the bristles in a standard plastic hairbrush. Still, the brush works pretty well, and my clients particularly like to use it for grooming their beards. It helps to shape and tame flyaways, and it’s fairly affordable. A great choice for new beardos out there! This curved wave brush is made to stimulate and massage your scalp when cleansing your hair, removing dirt and excess oil from it. Also, it helps to brush in beard balms and oils. The bristles are soft, yet firm. In my experience, I’ve noticed almost no lost bristles so far. Finally, the brush fits comfortably in the palm of your hand, and it features little recesses on both sides for a firmer grip. may scratch your face a little. 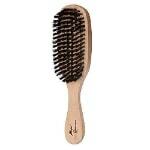 This Diane wave brush features a varnished light wood handle and the bristles made from nylon and boar. It’s about 60% nylon and 40% boar, and you can distinguish these two materials if you look closer. The bristles are fairly hard, and some people complain about them feeling too hard on the scalp, almost scratching it. On the other hand, my clients with thicker, coarse, super-wolfing hair often like this brush, noting that hair feels softer after regular use. Also, the brush seems to distribute natural oils from your scalp to the rest of your hair. Actually, this Diane hard wave brush is advertised as a brush for tight curls and coarse to very coarse hair. So if your hair is thin to normal, you probably want to look for a softer one. Generally, this wave brush does the trick pretty well, especially for the price. However, it hardly measures up against high-priced competitors. no good for thin to normal hair. This soft wave brush is meant for short hair. Featuring natural boar bristles, it stimulates and massages your scalp while cleansing hair, removing dirt, excess oil, and flakes as you brush. The reinforced bristles are supposed to stay attached, but in fact, some of them may break off with time. On the bright side, the handle is very convenient to hold and to use. The manufacturer claims that it’s uniquely designed. I don’t see any uniqueness here, but the handle is well-done indeed. This Magic wave brush works better for fine, thin hair. It’s almost useless for thicker hair or beards since it’s not coarse and deep enough for that purpose. The bristles are only about 1/2-inch long, and the brush itself is 9 1/2-inches long. However, you can try to use this wave brush for smoothing thicker hair, but keep in mind that it only brushes the top of your hair. On the plus side, it helps with flyaways and feels good on your scalp. the bristles break off with time. I love the maroon design of this brush – it looks so glossy and vibrant. The brush is rather comfortable to hold, being about 5 inches long and 3 inches wide. It’s made with 100% boar bristles which can be described as soft or soft medium. 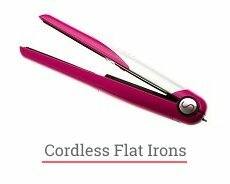 They’re great for polishing your waves and laying down frizz. The bristles don’t tend to lean which means faster progress, better pull, and better connections. Also, you can use this brush for thinning hair, vertical brushing, fresh cuts, and more. This 360 wave brush has a great pull indeed. It feels good on a low cut, literally massaging your scalp as it lays your hair down and adds extra shine. The only thing is, the bristles may shed from time to time. Also, you have to be delicate setting the brush down on the counter since it may get small indents from too much force. Other than that, it’s a top-quality product. comes with a box and a hair brush maintenance insert. 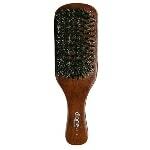 This oval-shaped wave brush is comfortable to hold, being 5-inches long and 3/4-inches wide. 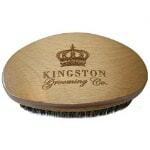 The design is very simple, just pure beechwood and white 1/2″ bristles, nothing in excess. Interestingly, the manufacturer claims that they make this Kent wave brush hand-finished using the finest timbers and natural bristles to ensure top quality. It’s a high-quality styling tool for men indeed. Also, this curve wave brush is said to be suitable for all hair types. It easily shapes and manages even thick hair. The bristles are rather stiff and hard to the touch, so I’d say it’s a firm wave brush. If you worry it may scratch your scalp, you may want to go for a softer brush. And for those who like this stimulating sensation when brushing, it’s quite a great option. 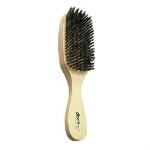 Just like with any other wave brush, the bristles will eventually wear out, and the outer rows will start to break off. If you clean your wave brush properly, the base shouldn’t crack. All in all, the quality justifies the cost, yet there are many other very decent brushes at a more favorable price. This kind of brush is made specifically for African-American hair to create defined coils and curls. For other hair types and textures, it probably won’t work that well. You can use both sides of Wirewzoll brush, depending on how long your hair is. Basically, your hair should be at least 1/2-inch long or longer. Each side has 32 holes, 7 mm in diameter each. The “lumpy” side gives you a quicker and more aggressive coil pattern. And the traditional hole side provides you with the less aggressive pattern, so it’s up to you. How do you make coils with that brush? First, your hair should be only slightly damp. Apply some styling gel on your hair and, optionally, on the sponge, too. Take a sponge and go in a circular motion across your head. Spin only in one direction and don’t press it heavily on your hair. Voila – and you get awesome defined coils in a matter of minutes! Last but not least, don’t go too fast when circling. That way you can prevent the deterioration of the sponge (yeah, this may happen). little pieces may come off when styling, and they’re difficult to fish out from hair. When it comes to this Diane medium wave brush, the main concern is whether it’s made with 100% boar bristles or not. The softer side of the brush seems to be made with boar bristles indeed. This softer side is great for smoothing your hair after styling. And the other, stiffer side has plastic bristles. I use it to get deep into hair and straighten any kinks or waves. 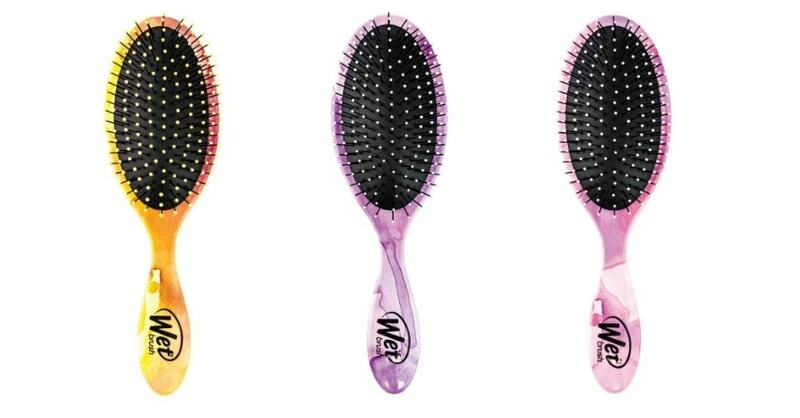 It’s recommended to use this wave brush on medium-coarse to coarse hair of any length. Just like some other Diane wave brushes, this one features not only advanced implantation technology that reduces bristles loss but also UV coating for protecting your hair against moisture and wear. 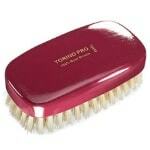 The brush is gentle enough on your scalp, yet the plastic bristles may feel hard and even sharp. Thanks to the palm size, it’s rather comfortable to hold and to use. plastic bristles may feel sharp on your scalp. Men will probably appreciate the simple, yet somewhat manly design of this brush. It’s made with mahogany brown wood and 100% pure boar bristles. The handle is long enough and comfortable to hold, yet the brush itself turned out to be a bit smaller than I’d expected. As for the stiffness, the brush is advertised as a firm one. I would say it’s rather medium to hard, and for some of my clients, it actually feels soft. Then again, when it comes to stiffness, it’s very individual. This Wav Enforcer Spin wave brush is made to style low to medium cuts, and the firm, deep bristles are designed for thicker hair. They help to stimulate your scalp and distribute natural oils all over your head for healthy hair growth. The brush has a great pull, but it probably won’t help with heavy wolfing stages. In a nutshell, it gets the job done, and it’s a great choice for the price. Just like many other wave brushes in my top-list, this one is made with 100% boar bristles. But what really distinguishes it from the competitors is the UV coating that protects your hair against moisture and wear. The brush works best for medium to coarse hair, and it’s great for all hair lengths. The bristles are soft rather than medium, and it’s hard to comb hair with them properly. It’s more like smoothing the hair. Still, one of my clients likes to use this brush on his beard, untangling and smoothing along the way. This Diane wave brush features an advanced implantation technology to reduce bristles loss, yet some bristles will probably come out with time. On the bright side, wider bristles row spacing provides better connection. And the grip is comfortable even for large men’s hands. The only problem is, there are lots of fakes sold on Amazon, so be careful when choosing the seller. too soft for some people – it’s hard to comb hair properly. This wave brush is said to be made with handcrafted wood which is a nice touch. It’s great for taking care of either your hair or your beard. Boar bristles help to distribute natural oils from your roots to the ends, preventing oil build-up and eliminating frizz. Also, this process somewhat helps to condition hair naturally, adding volume and shine. As for the stiffness, I’d say it’s a medium wave brush. In my experience, it works well for both thin and thick hair, yet that’s individual. 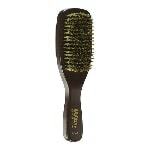 Some of my clients note that this brush does a great job taming their thick curly hair with multiple cowlicks. Others believe that it’s better for fine hair. Anyway, this brush feels good coursing through hair. But if you overuse it, you may irritate your skin a bit, so be careful. As for the price, it’s neither very expensive nor too cheap. Just the right cost for a high-quality wave brush. bristles may shed now and then. This curved wave brush is a must-have for all wavers. The only thing is, it may feel too hard for some people, while for others, it’s rather soft to medium. I guess such thing as stiffness is extremely individual. Other than that, it’s just perfect. 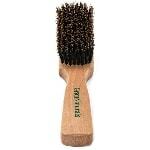 Made with 100% boar bristles, this wave brush has good pull and lay. It feels great on the scalp and covers a good portion of hair with each stroke. The bristles shedding is minimal. They almost don’t lean, providing better connections and faster progress. comes with a box plus a hair brush maintenance insert. Looking for a top-quality wave brush for your hair or beard? Look no further – this one is just for you! It’s made with solid beechwood and 100% boar bristles of the finest grade. Say no to fillers or nylon! The bristles seem to be heavily reinforced so that they won’t fall out. 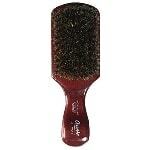 Thanks to its ergonomic, oval-shaped design, this curve wave brush is extremely convenient to hold and to use. It fits perfectly in your palm, being 5 inches long and 2.5 inches wide. Plus, the handle has a groove on both sides for even better grip. This wave brush for men feels great on your scalp, hair or beard without being too rough on your face and skin. The bristles are neither too hard nor too soft – it’s just the right medium stiffness. Although, for some people, the bristles are still a bit softer than they would like. Still, this boar bristle wave brush helps to redistribute natural oils throughout your hair and beard, polishing and conditioning it. And you can use it for better distribution of styling products as well. Thanks to this Kingston wave brush, your hair and beard feel soft, clean, and shiny. Last but not least, it comes with a nice travel box that prevents crushed bristles and keeps your brush clean. comes with a sturdy storage box. What does a wave brush do? Well, wave brushes are designed specifically for African-American hair. Basically, they’re meant to train your hair to create waves. For instance, you can use such a brush to get 360 waves, aka “360s,” “waves,” or “spinnas.” Or you can just add it to your everyday hair care routine. The wave brush may not differ from a regular brush that much, but the point of distinction lies in the softness of bristles. It’s better to choose a wave brush with natural boar bristles that help to distribute natural oils from the roots to the ends. This process makes your waves shinier, eliminates frizz, and helps with flyaways. How to clean a wave brush? Remove any loose hair by hand or using the handle of a slim comb, gently lifting hair out of the bristles. Then, wash your wave brush in a quality shampoo but don’t condition it. Using a conditioner will probably soften the bristles. Finally, thoroughly rinse your brush in cold water. Let it air dry with the bristles facing down away from sunlight, radiators, blow-dryers and any artificial heat. Some people use dish soap or warm soapy water instead of shampoo. Never use ammonia or harsh detergents for that purpose! Be very careful and gentle with natural boar bristles. And avoid soaking the wooden base in water. Being exposed to water, it may crack. What is the best wave brush? It’s almost impossible to name a particular brand or model. I’ve listed just 14 of them, and there are many more decent brushes on the market. I can only tell how do you choose a good wave brush. 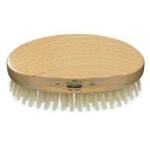 It should have natural boar bristles that help to distribute natural oils, making your hair smoother and shinier. Also, boar bristles massage your scalp and somewhat improves blood circulation. They’re more suitable for short dry hair. 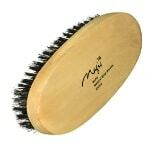 And if you have thick hair, you may want to try out a wave brush with nylon bristles. There are models either with a handle or without one. Personally, I prefer wave brushes with a handle as they’re more comfortable to hold. But if you want to have a brush in your travel bag, in your car or take it on the go, a compact wave brush with no handle will come in handy. As for the price, it shouldn’t be the key factor when choosing a wave brush, yet it’s important as well. I have to admit, affordable wave brushes usually don’t measure up against high-priced ones. Still, you can find a decent brush at a reasonable price. Where to buy a wave brush? Just like with other styling tools, you can buy wave brushes in big grocery stores, in professional haircare stores or online. Personally, I prefer to search for new brushes on Amazon. Such online shops offer a great choice of hair care products, including brushes. In all seriousness, choosing a good wave brush takes some knowledge and practice. I can only give you some advice, and you have to find out what works best for you all by yourself. As I said earlier, the brush stiffness is very individual. Don’t rely only on the advertisement. At least, read the reviews to find out whether this brush feels soft or hard on hair. Also, remember that natural boar bristles are more beneficial for your hair. Then again, read the ad carefully to make sure the bristles are 100% natural. Some vendors just add a few boar bristles to plastic ones and advertise it as a boar-bristled wave brush. Technically, they’re not entirely wrong, but it’s better to avoid future disappointment. 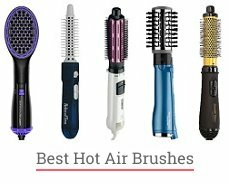 What is the best wave brush for you? 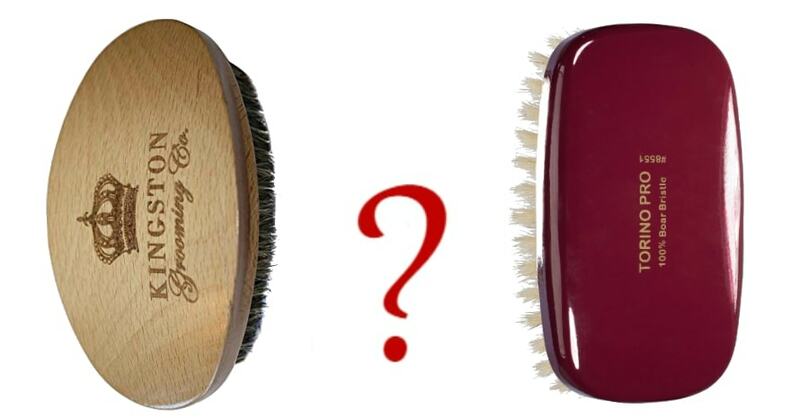 Do you prefer a hard wave brush or a softer one for your hair type? Do you think it’s possible to find an inexpensive brush of high quality? Please, feel free to leave your comments below. See you! Previous Previous post: Best Hair Gel for Men: How To Get The Strongest Hold and Ultimate Shine? I’ve always wanted to have 360 waves hairstyle but my curly hair is so strong that it just can’t be done with using only a wave brush… Can you recommend some hair care products to make my hair styling easier? Check my hair care section at my website to get more recommendations on styling. If you have any specific request on hair care products recommendations, please ask here. Can my husband be allergic to boar bristles? I’ve purchased a brush of that kind for mens wave hair and when he started using it red dots appeared on his head and neck. The other complaint is terrible itchiness he has. The brush I bought is not listed here but it also has boar bristles. Is that can be a reason for such a problem? Hi, Betty! Thank you for your question. 360 waves is one of my favorite hairstyles. I tried searching the web to find out how to make such a hairstyle at home but haven’t found anything appropriate for my short curly hair. Can you tell how to get 360 waves with short hair? I was looking for the appropriate 360 waves process brush for a long time and your article is very helpful, thanks for sharing it with us! 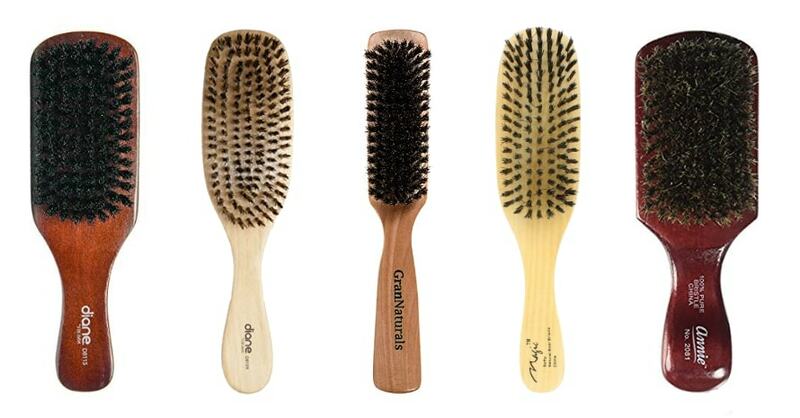 GranNaturals brush you’ve suggested here is the best option for me I think. I tried other boar bristle brushes before (they are not mentioned here) but the bristles were so soft that it was impossible to form the hairstyle you want. My advice for those who like wooden brushes as I do: do not leave your wooden brush in water to clean it. All you need is to rinse it a little bit. Water can cause cracking of wood. Just an ordinary Diane brush for waves is enough to form hairstyles for me. My hair is so corse and I tried using a lot of different brushes. The Diane model you mentioned here, Monica, is the best decision for me. The combination of boar and nylon bristles is something – it’s hard enough to handle even with my unruly hair. And the main thing is that this brush is much better than some expensive models I tried. My advice to people with corse hair: don’t waste your money on something more expensive than Diane brush.